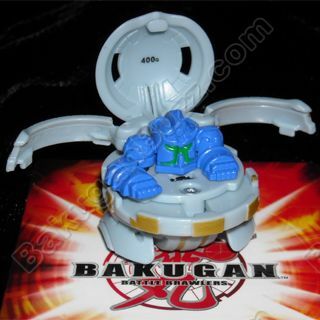 Bakuganbuzz Exclusive: Bakugan -The New Vestroia! Welcome to Bakugan Season 2: The New Vestroia! Right after defeating Masquerade in a fierce brawl between Drago and Alpha Hydranoid to save Vestroia from total destruction -Vestroia is facing yet again another danger in the hands of the alien race -Vestals, headed by King Zenoheld and his team of ferocious brawlers called the Vexos. The Vestals have constructed dimension controllers around the New Vestroia that rendered all the Bakugan helpless in their ball forms. In addition to that an evil scientist called Professor Clay have initiated tests to create mechanical bakugan that has no weakness at all. Using all his might, can Dan and his newly found team known as Bakugan Battle Brawlers Resistance defeat these evil forces to free all the enslaved Bakugan? Just tune in and find out! This could take awhile, thank you for your patience. Stay Tune! We will be right back! Comments Off on Bakuganbuzz Exclusive: Bakugan -The New Vestroia! Hey guys! Time to check your Baku Meters! Just scanned from the database today guess who? -it's Julie's Hammer Gorem! Let's go ahead and check why this bakugan is one of our all time favorites! Don't miss this out! 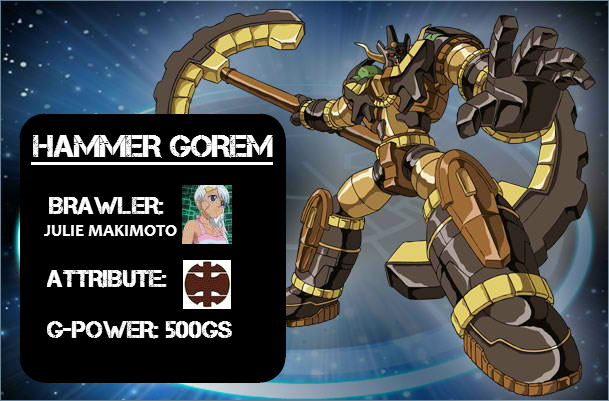 Hammer Gorem is a brute yet noble fighting guardian bakugan of Julie Makimoto. Hammer Gorem is the 2nd Stage evolution of Gorem and features a heavier iron cladded armor and armed with its two-sided hard swinging hammer, Hammer Gorem is always ready for an action packed brawl! 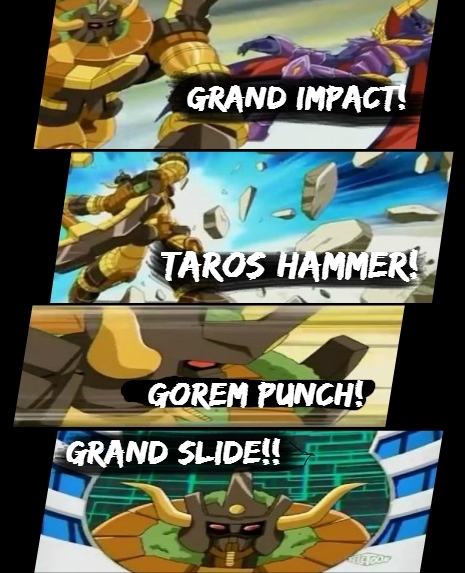 Grand Impact: This ability can be used when Hammer Gorem enters battle. The ability will nullify the opponent's Gate Card and will transfer 200 Gs from the opponent to Hammer Gorem. Gorem Punch: Reduces 300 Gs from the opponent. Grand Slide: Moves a Gate Card. 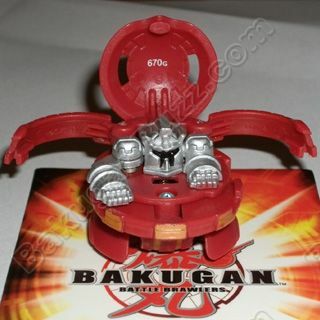 **Do you want to suggest other of your favorite Bakugan to be scanned by Bakuganbuzz's Baku Meter? Just drop us a comment and let us know! Comments Off on Bakumetered: Hammer Gorem! Hi Everyone! 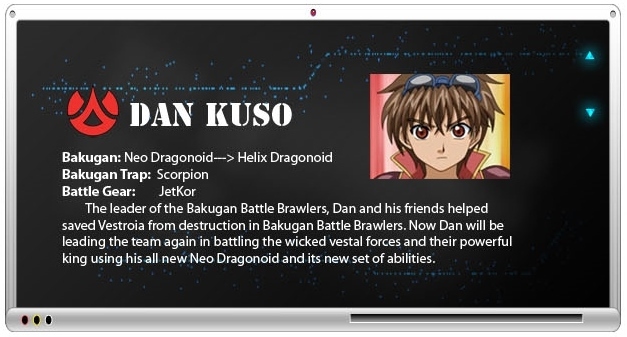 Thanks for making BakuganBuzz your #1 Bakugan Resource website! As a gesture of gratitude we will be posting cooler than ever contents to satisfy your Bakugan Action cravings in a weekly basis! We will start of with nice bite sized Bakugan action in it's climax and we will call it: Bakugan Power Play! Here we will feature legendary Bakugan Brawls from the 1st Bakugan Season to the latest! Who wants some piece of Bakugan Power Play Action? 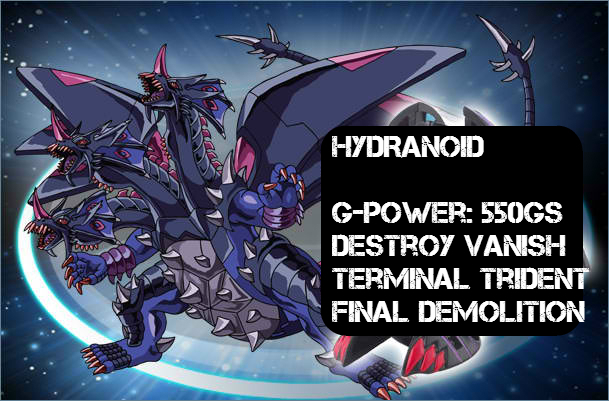 First up would be -Bakugan Power Play Week#1: Ultimate Dragonoid vs. Alpha Hydranoid! Coming Real Soon! 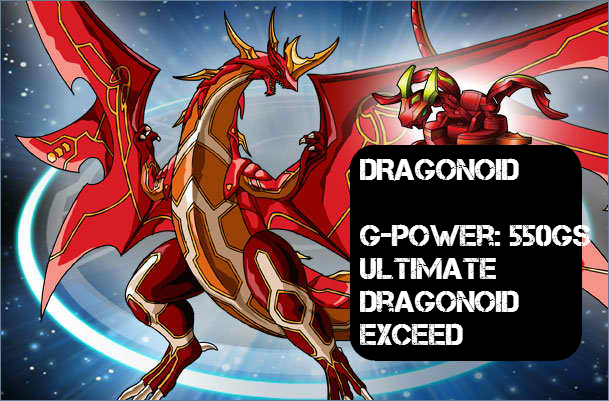 -only here @Bakuganbuzz.com! While a fairly simplistic strategy, this is one of Aquos's lastest and most ruthless tactics that come in the first wave of Mechtanium Surge. Silver Nugget is a Silver Gate card that not only offers a 130 bonus to Aquos, but allows players with Aquos or Subterra Bakugan in battle to get a +100G bonus to each of their Bakunano. Now normally you should be careful with cards like this as your opponent could use its power against you, but on average, Aquos and Subterra are the least common attributes you will experience in the game, so you should be pretty safe from this strategy backfiring. So even if you don't win the battle, your opponent will practically empty out their unused pile catching up with you, leaving the rest of the game for you to hit them while they're left with nothing to fight back. And all you did was play a support piece, one Ability, and some Nano. Simple, effective, conservative, and devastating. Everything a good Aquos brawler needs to win. After going over the basic team setup last month on Battle Tactic issue #16, we continue forward with BrightLight's Battle Tactic this month in reviewing the basic requirements and rules in setting up a brawl and winning a battle! In a 2 player game, both players sit across from each other in the field. The goal of the game is to be the first to capture 3 Gate Cards. Each player's right side is for unused Bakugan and Cards, called the "Unused Pile." All cards are placed faced down in your Unused Pile so your opponent can't see them. Each player's left side is for used Bakugan and Cards, called the "Used Pile." To start, each player places one of their Gate Cards face down in the middle of the battlefield in the space closer to their opponent, furthest from themselves. Gate Cards are replaced when there are no more Gate Cads in the field. Begin play with your Team Setup of 3 Bakugan, 3 Gate Card and 3 Ability Cards. Refer to Battle Tactic #16 for more info. The youngest player goes first, and then players take turns. Players must be 2 cards lengths from the battlefield to begin their roll. Select and roll your Bakugan over the Gate Cards in the center of the battlefield. If the Bakugan misses and does not land on a Gate Card, it goes into your Used Pile. Now it is your opponent's turn. If you do land on a Gate Card but no other Bakugan are standing on that Gate Card, it is your opponent's turn to roll. If your Bakugan lands on a Gate Card where your opponent already has a standing Bakugan, then battle begins! 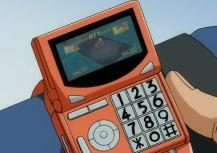 During battle, each player looks at the G-Power printed on the inside of their Bakugan. Then, flip over the Gate Card and look at the numbers on the left listed in the colored circles. Each circle matches a Bakugan Attribute which is called the Gate Attribute Bonus. Now each player adds the Gate Attribute Bonus that corresponds to their Bakugan. This is your total G-Power. If there is no text on bottom of the Gate Card and no one plays any Ability Cards or any Support Pieces, the brawler with the high total G-Power wins the battle, captures the Gate Card and places it in their Used Pile. Remember, the first brawler to capture 3 Gate Cards wins the game! Now, each player places their battling Bakugan in their Used Pile. Don't forget that before you roll, during your turn or after battle, you may play any applicable Ability Cards that are in your Unused Pile. You may even play ALL of your Ability Cards, but choose your cards wisely! Ability Cards go into your Used Pile once you have used them. Also, during a battle, you may play a Support Piece such as Mechtogan, Mechtogan Titans, Mobile Assaults, Battle Gear or Traps. These Support Pieces will add a G-Power boost to help annihilate your opponent! Additionally you may use your BakuNano to give you the edge over your opponent! and to discuss more about Game Play, join the official Bakugan community at My.Bakugan.com!